In a small cemetery of a parish churchyard in Olney, England, stands a granite tombstone with the following inscription: "John Newton, clerk, once an infidel and Libertine, a servant of slavers in Africa, was, by the rich mercy of our Lord and Savior Jesus Christ, preserved, restored, pardoned, and appointed to preach the Faith he had long labored to destroy." This fitting testimonial, written by Newton himself prior to his death, describes aptly the unusual and colorful life of this man, one of the great evangelical preachers of the eighteenth century. John Newton's mother, a Godly woman, died when he was not quiteseven years of age. When his father remarried and after several brief years of formal education away from home, John left school and joined his father's ship, at the age of eleven, to begin life as a seaman. His early years were one continuous round of rebellion and debauchery. After serving on several ships as well as working for a period of time on the islands and mainland of the West African coast collecting slaves for sale to visiting traders, Newton eventually became a captain of his own slave ship. Needless to say, the capturing, selling and transporting of black slaves to the plantations in the West Indies and America was a cruel and vicious way of life. On March 10, 1748, while returning to England from Africa during a particularly stormy voyage when it appeared that all would be lost, Newton began reading Thomas a Kempis's book, Imitation of Christ. Kempis was a Dutch monk, 1380-1471, who belonged to an order called the Brethren of the Common Life. This book is still printed today as a religious classic. The message of the book and the frightening experience at sea were used by the Holy Spirit to sow the seeds of Newton's eventual conversion and personal acceptance of Christ as his Savior. For the next several years he continued as a slave ship captain, trying to justify his work by seeking to improve conditions as much as possible, even holding public worship services for his hardened crew of thirty each Sunday. Eventually, however, he felt convicted of the inhuman aspects of this work and became a strong and effective crusader against slavery. Newton returned to England, established a home with his youthful sweetheart, Mary Catlett, whom he had married on February 12, 1750, and became a clerk at the Port of Liverpool for the next nine years. During this period he felt the call of God increasingly to preach the gospel and began to study diligently for the ministry. He was greatly aided and influenced by the evangelist George Whitefield as well as the Wesleys, but he decided to stay within the established Anglican Church rather than to join forces with these Dissenters. At the age of thirty-nine, John New¬ton was ordained by the Anglican Church and began his first pastorate at the little village of Olney, near Cambridge, England. His work for the next fifteen years (1764-1779) was a most fruitful and influential ministry. Especially effective was the use of the story of his early life and conversion experience, which he told often. In addition to preaching for the stated services in his own church, Newton would hold services regularly in any large building he could secure in the surrounding area. This was an unheard of practice for an Anglican clergyman of that day. Wherever he preached, large crowds gathered to hear the "Old Converted Sea Captain." Another of Newton's extremist practices at the Olney Church was the singing of hymns that expressed the simple, heartfelt faith of his preaching rather than the staid singing of the Psalms from the Sternhold and Hopkins Psalter, which was practiced in other Anglican churches. When Newton couldn't find enough available hymns for this purpose, he began writing his own. To assist him in this endeavor, he enlisted the aid of his friend and neighbor, William Cowper, a well-known writer of classic literature of this period. In 1779 their combined efforts produced the famous Olney Hymns hymnal, one of the most important single contributions made to the field of evangelical hymnody. In this ambitious collection of 349 hymns, sixty-seven were written by Cowper with the remainder by Newton. The purpose of the hymnal, according to Newton's Preface, was "a desire to promote the faith and comfort of sincere Christians." Since 1947, an interesting ancient tradition has been revived at the Olney Church. It is the annual pancake race that is held on the Tuesday (Shrove Tuesday) prior to the beginning of Lent. The ladies of the parish race from the center of town to the church flipping pancakes. At the service the winner is announced followed by the congregation singing "Amazing Grace" and other Olney Hymnal favorites. After concluding his ministry at Olney, Newton spent the remaining twenty-eight years of his life as pastor of the influential St. Mary Woolnoth Church in London. Among his converts there was Claudius Buchanan, who became a missionary to the East Indies, and Thomas Scott, the Bible commentator. By this time Newton had also established a strong relationship with William Wilberforce and other political leaders engaged in the crusade for the abolition of the slave trade. It is interesting to note that the year of Newton's death, 1807, was the same year that the British Parliament finally abolished slavery throughout all of its domain. In 1790 Newton's wife, beloved companion for forty years, died of cancer. Mary had been a wife of true devotion and encouragement, but now John faced the nest seventeen long years without her. In 1893 John and Mary's remains were re-interred in the Olney Church graveyard, where the massive granite monument can still be viewed. 1. The Lord has promised good to me. His Word my hope secures;He will my shield and portion be as long as life endures. 3. The earth shall soon dissolve like snow, the sun forbear to shine: But God, who called me here below, will be forever mine. 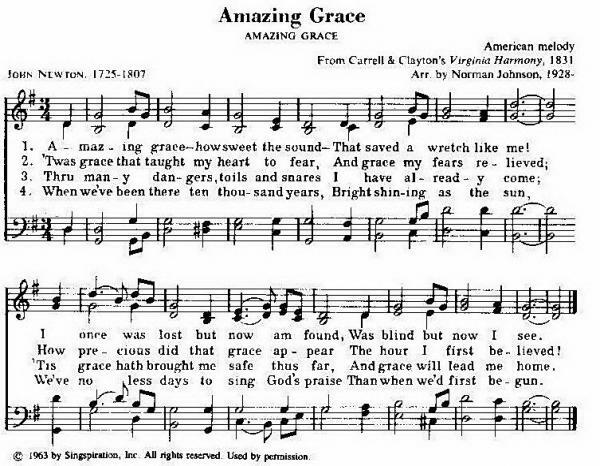 The tune, "Amazing Grace," is an early American folk melody. It was first known as a plantation melody entitled "Loving Lambs." The earliest known publication of this tune was found in a book entitled The Virginia Harmony, compiled by James P. Carrell and David S. Clayton and published in 1831 in Winchester, Virginia. Scarcely a hymnal appeared throughout the South during the remainder of the nineteenth century that did not include this hymn. John Newton also wrote the text for "Glorious Things of Thee Are Spoken" (101 More Hymn Stories, No. 26). Taken from 101 Hymn Stories © Copyright 1982 by Kenneth W. Osbeck. Published by Kregel Publications, Grand Rapids, MI. Used by permission of the publisher. All rights reserved.